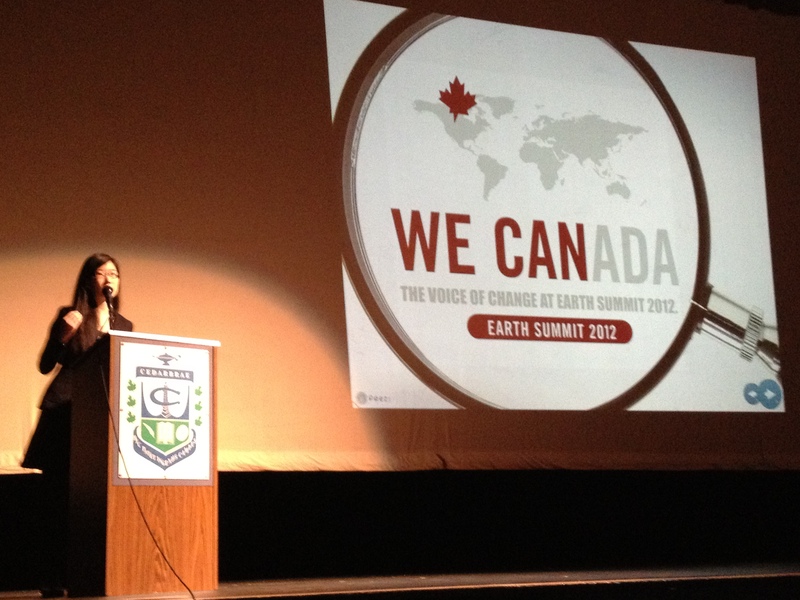 We Canada, Earth Summit, Stops into Cedarbrae! I contacted We Canada, as part of their cross Canada Tour to stop into Cedarbrae C.I. to discuss sustainability with us. The power of social media is amazing as I first heard about them from twitter, Tweeted a couple people @@Earth2Victoria and @aleksandrarocks within days they happened to be in our school auditorium. Victoria Wee lead us through an engaging presentation in what we can do to develop sustainable practices in our lives, community and country. She stressed the importance of the United Nations Conference on Sustainable Development that is happening in Rio this year. During a breakout session Victoria and Aleksandra worked with our Eco Club and asked what was important to the students. On sticky notes they collected the answers and will be combining them with student responses across Canada. We only have one planet to live on! The way we are living beyond our carrying capacity we may not have much to look forward to or our future generations. Mobilizing youth to get engaged, speak up and take action is our best bet to combat issues such as climate change and work towards a sustainable future.